There are lots of grain synthesis aps out now so this one has some competition. How does it stand up? Pretty well. Like most of the grain synthesis aps, the audio quality is quite good. It has the usual features but adds a kind of “playability” that is hard to describe but easy to recognize once you get your hands on it. The new version’s ability to use LARGE audio files (something like 20 minutes long) sets Spacecraft apart as very unique and can be quite useful. So on these points it competes pretty well. However, its integration into the Audio Units world is rather odd. You must use it as an EFFECT in AUM, for example, while it is clearly a source (an actual synthesizer capable of originating its own sounds). When used as an AU, only one of the two channels is available in any one slot. Being an AU, you should be able to launch more than one instance of Spacecraft. But sadly, that will not work. Doing so results in crashing both instances. The other major problem at this point in its history is that the ap will not save your work; it has no ability to save presets. However, the developer assures us that this feature is coming in a future release. If these things were fixed, my personal opinion of Spacecraft would go up to rate it at least at four stars because I could actually use it and really exploit its otherwise very good capabilities. When used as as AU effect you can record audio from an upstream instrument or microphone via the import sound button. This is why it is currently an AU effect. Sounds great! Can't save or import anything on iOS 9 or 10. 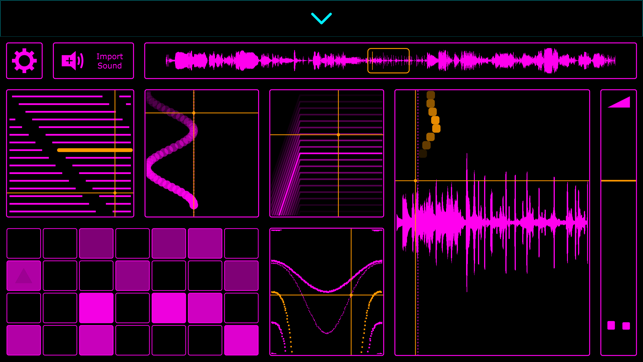 I like this simpler-than-iDensity granular synth quite a lot. It is more immediately intuitive than Tardigrain without losing the wonderful unpredictability of granular synthesis in producing interesting, beautiful, arresting, terrifying sounds. 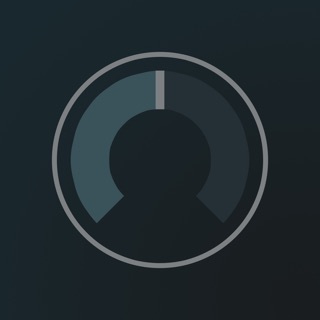 The interface is one of the better distillations of granular parameters that I have seen so far on the App Store. Unfortunately, Spacecraft does not truly support Audioshare; it supports Apple's Files app, leaving users on iOS 9 and 10 with only iCloud for sound import/export. Nor does it store presets internally. Those have to go on iCloud as well. I don't use iCloud, and don't see much point in uploading my samples there to redownload them into a single app when Audioshare has everything already here on my iPad. So for now, Spacecraft is a demo on my iOS 9-running mini. A really nice demo--I hope to be able to make better use of it soon. 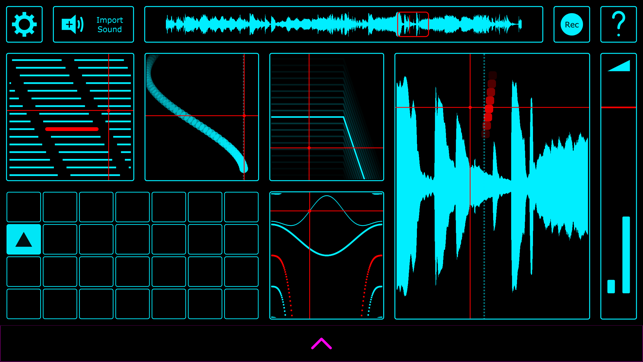 This is actually a cool granular synth app. 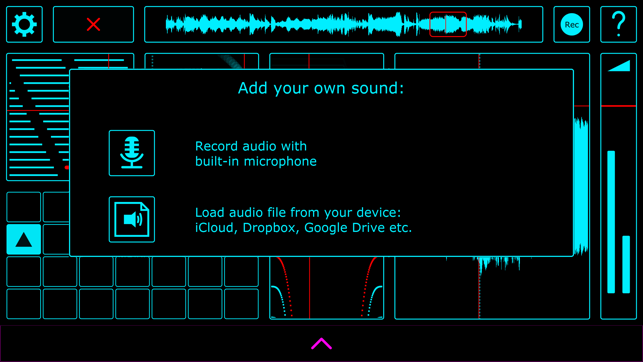 Like most apps of this style, access to your audio files is critical for the complete enjoyment of this instrument. The controls are really nice. The addition of a sequencer really make this granular synth standout, making live performance that much easier. True IAA support is MISSING. 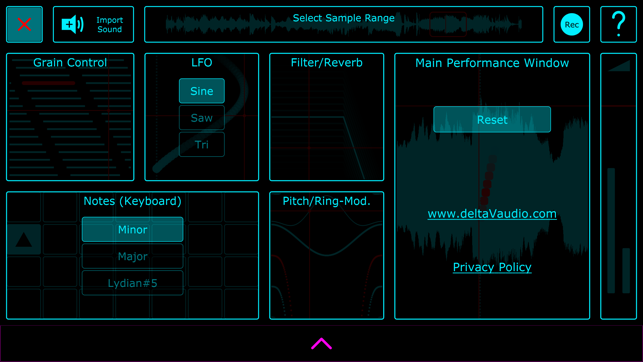 My audiobus 3 and Beatmaker 3 do not see it an instrument, and sorry but effect “only” IAA is not good enough. Not when you can make some amazing stuff now but can not use it in your AB3 and Beatmaker 3. But the biggest infraction: NO AUDIOSHARE SUPPORT! This is a granular synth and the first thing you should be programing in is an option to go directly to your audioshare and grab your waves. This should be a rule for EVERY programmer when it comes to developing user sample/wave dependent synths like granulars: get your audioshare protocols handled FIRST. Get that done and out of the way before you even look at posting into the app store. Roll out the next update with direct to audioshare and I’ll change the rating to 4 stars. 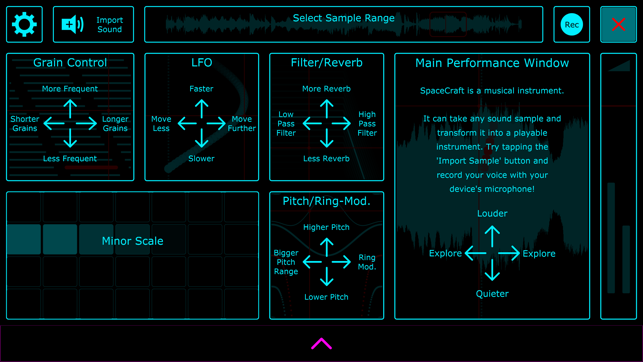 Audioshare and true IAA support so my Audiobus 3 and Beatmaker 3 can use this as an instrument gets you all 5 stars. Make this happen asap, please, you got a good app here.